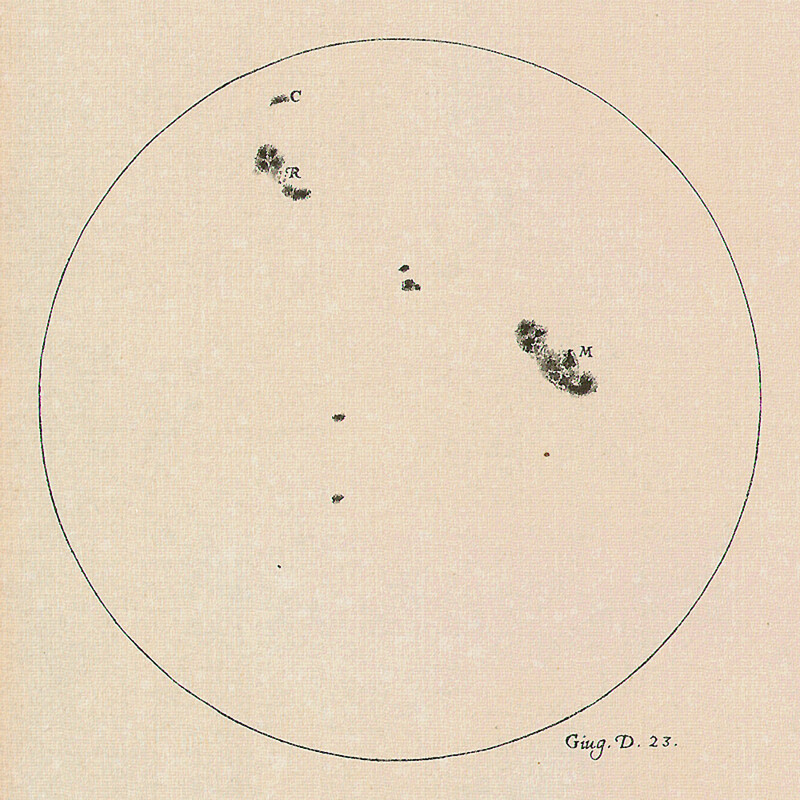 A drawing of the Sun made by Galileo Galilei on 23 June 1613 showing the positions and sizes of a number of sunspots. Galileo was one of the first to observe and document sunspots. Image credit: The Galileo Project/M. Kornmesser. The Sunspot Number, the longest scientific experiment still ongoing, is a crucial tool used to study the solar dynamo, space weather and climate change. 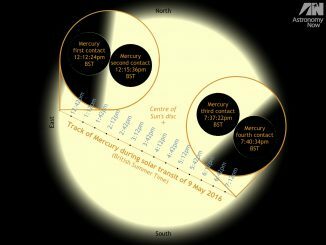 It has now been recalibrated and shows a consistent history of solar activity over the past few centuries. 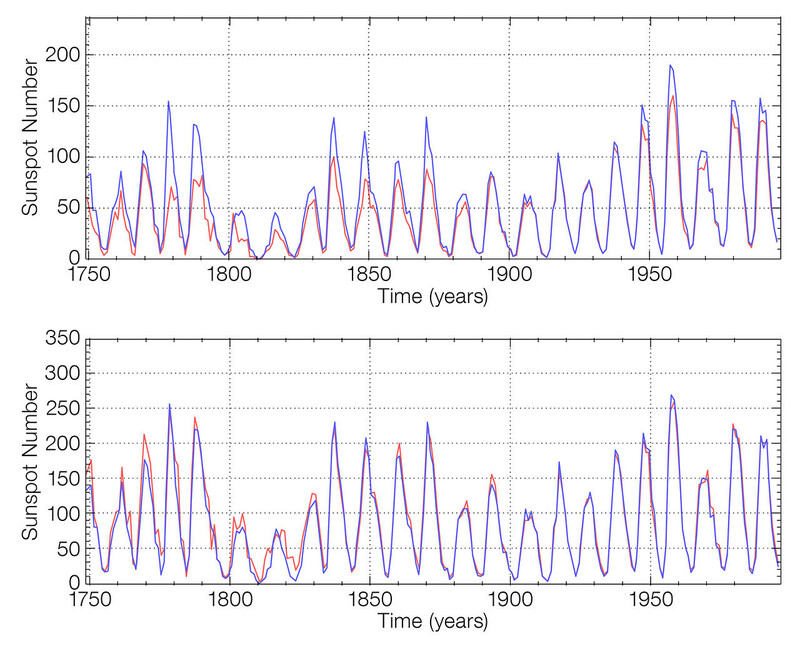 The new record has no significant long-term upward trend in solar activity since 1700, as was previously indicated. This suggests that rising global temperatures since the industrial revolution cannot be attributed to increased solar activity. The analysis, its results and its implications for climate research were made public on 7 August at a press briefing at the International Astronomical Union (IAU) XXIX General Assembly, currently taking place in Honolulu, Hawai`i, USA. 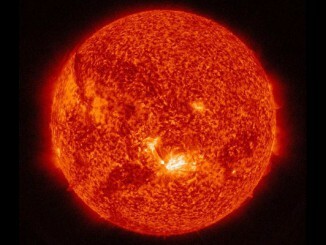 The Maunder Minimum, between 1645 and 1715, when sunspots were scarce and the winters harsh, strongly suggests a link between solar activity and climate change. Until now there was a general consensus that solar activity has been trending upwards over the past 300 years (since the end of the Maunder Minimum), peaking in the late 20th century — called the Modern Grand Maximum by some. 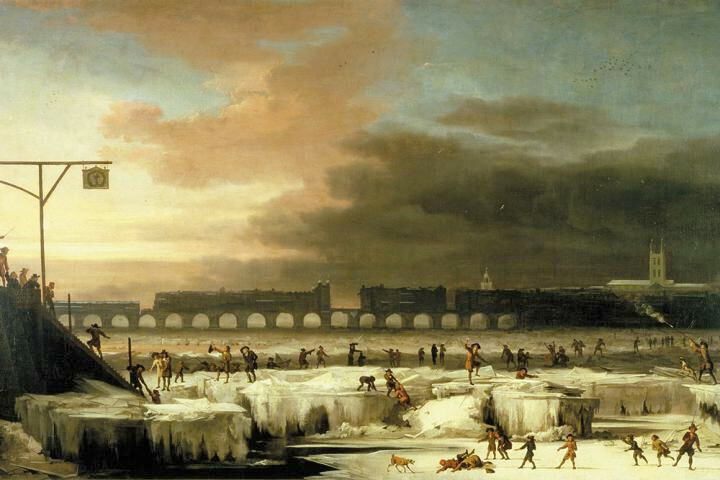 In this 1677 painting by Abraham Hondius, “The Frozen Thames, looking Eastwards towards Old London Bridge,” people are shown enjoying themselves on the ice. In 17th century there was a prolonged reduction in solar activity called the Maunder Minimum, which lasted roughly from 1645 to 1700. During this period, there were only about 50 sunspots instead of the usual 40-50 thousand recorded. Image credit: Museum of London. The two methods of counting the sunspot number — the Wolf Sunspot Number and the Group Sunspot Number — indicated significantly different levels of solar activity before about 1885 and also around 1945. With these discrepancies now eliminated, there is no longer any substantial difference between the two historical records. The top graph shows the level of disagreement between the old Wolf Sunspot Number (blue) and the old Group Sunspot Number (red). The lower graph demonstrates the increase in similarity between the two after being recalibrated. Image credit: WDC-SILSO. The new correction of the sunspot number, called the Sunspot Number Version 2.0, led by Frédéric Clette (Director of the World Data Centre [WDC]–SILSO), Ed Cliver (National Solar Observatory) and Leif Svalgaard (Stanford University, California, USA), nullifies the claim that there has been a Modern Grand Maximum. The results, presented at the IAU XXIX General Assembly in Honolulu, Hawai`i yesterday, make it difficult to explain the observed changes in the climate that started in the 18th century and extended through the industrial revolution to the 20th century as being significantly influenced by natural solar trends. The sunspot number is the only direct record of the evolution of the solar cycle over multiple centuries. The apparent upward trend of solar activity between the 18th century and the late 20th century has now been identified as a major calibration error in the Group Sunspot Number. Now that this error has been corrected, solar activity appears to have remained relatively stable since the 1700s. A graph showing the sunspot Group Number as measured over the past 400 years after the new calibration. The Maunder Minimum, between 1645 and 1715, when sunspots were scarce and the winters harsh is clearly visible. The modulations of the 11-year solar cycle is clearly seen, as well as the 70–100-year Gleissberg cycle. Image credit: WDC-SILSO. The newly corrected sunspot numbers now provide a homogenous record of solar activity dating back some 400 years. Existing climate evolution models will need to be reevaluated given this entirely new picture of the long-term evolution of solar activity. This work will stimulate new studies both in solar physics (solar cycle modelling and predictions) and climatology, and can be used to unlock tens of millennia of solar records encoded in cosmogenic nuclides found in ice cores and tree rings. This could reveal more clearly the role the Sun plays in climate change over much longer timescales. The new data series and the associated information are distributed from WDC-SILSO. It is a member of the World Data System of the International Council for Science (ICSU), dedicated to the preservation and distribution of large and/or long-duration reference datasets in all domains of science. 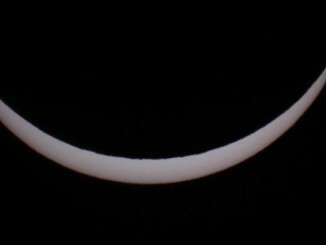 While clouds did their best to obscure the solar eclipse, many observers have still been able to witness the Moon moving in front of the Sun. The Sun emitted a mid-level solar flare, peaking at 8:33am BST on 24 August 2015. NASA’s Solar Dynamics Observatory, which watches the Sun constantly, captured the image of the event shown here. Although harmful radiation from such a flare cannot pass through Earth’s atmosphere, intense flares can disturb the atmosphere in the layer where GPS and communications signals travel.